Your vehicle’s timing belt isn’t just important. It’s a crucial component of your engine. The timing belt is integral to make sure that your engine operates as it should. Here at Urban Autocare, we replace timing belts, protecting your vehicle from damage while ensuring that your engine operates as it should. Let’s take a look at the purpose of the timing belt, signs that you may have a failing timing belt, and why it’s crucial to have your belt replaced before it fails. What Does Your Timing Belt Do? 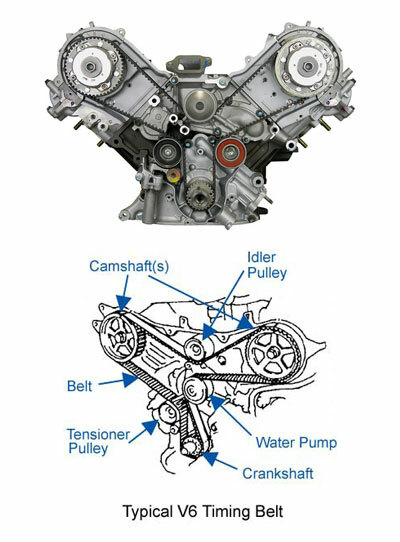 The timing belt is essential for timing the camshafts which control piston firing in the engine. In conjunction with the camshaft, the timing belt determines when engine valves open and close, which provides precise timing for piston firing. The timing belt and camshafts determine how much torque your engine produces, and they ensure that your engine runs smoothly and efficiently. Clicking, Whirring, and Squealing: If you notice that your engine is making strange noises as it runs, the timing belt could be to blame. These noises can be especially prevalent just as you start the engine. Difficulty Starting: If your car isn’t starting right after you turn the key, your timing belt may be slipping or nearly broken. If your car won’t start at all, your timing belt may be completely broken. No Warning: Sometimes the belt will fail with no warning at all. It ages even if you don’t drive the vehicle as it has rubber in the belt and in this dry Colorado air, it will start to dry out the belt. We recommend the belt be done at least every 8 years, but for sure by 10 years depending on the vehicle, regardless of mileage. Records: Unless you have a copy of an invoice showing when the timing belt service was done, don’t assume it was actually done. If it fails or a roller or tensioner for the belt fails, it could become a very costly job as internal engine components could be damaged. How Do You Check a Timing Belt? The timing belt is at the front of an engine’s crankshaft. And unfortunately, it’s completely self-contained. You won’t be able to examine the timing belt without disassembling part of the engine. Thus, it’s highly recommended that you bring your vehicle to a mechanic if you have concerns about your timing belt. That said, if you do decide to pull your engine apart yourself, you can tell if a timing belt is damaged if it is frayed, shredded, cracked, or missing teeth. If your timing belt is failing, you should take your vehicle to a mechanic immediately—don’t attempt to drive your vehicle to a repair shop; have it towed. If your timing belt does fail or break completely while running the engine, you can cause irreparable damage to the engine. Valves can bend, the camshaft and cylinders can be damaged. It’s likely that your engine will be totaled if your timing belt fails while the engine is running. Even if you have an interference engine, a timing belt failure can ruin your engine. Don’t let your timing belt ruin your engine. If you’re experiencing any of the above signs, then it is time for you to stop in and visit your local mechanics here at Urban Autocare. We have two locations — City Park West and Lakewood — and we’re proud to serve folks throughout the Denver Metro area, including our friends in Park Hill, Washington Park, Downtown, and Uptown. We also work with all sorts of makes and models, including Jeep, Subaru, and Toyota, to name a few. Trust us to take a look at your timing belt. We provide timing belt replacements, and that might just save your engine! Timing belts should be replaced every 60,000 to 100,000 miles, or 8-10 years depending on the vehicle and engine. We also recommend replacing the water pump if it is driven by the timing belt to prevent future issues with it. We also replace the timing belt tensioner and other rollers at the same time. Contact us to find out about recommended replacement time. Contact Urban Autocare to schedule your timing belt replacement!